The liberal media attitude toward Putin changed from lukewarm to hostile almost overnight between July 16 and July 21, simultaneously with the creation and adoption of the Trump-Putin conspiracy theory as a major part of the Democratic Party line. 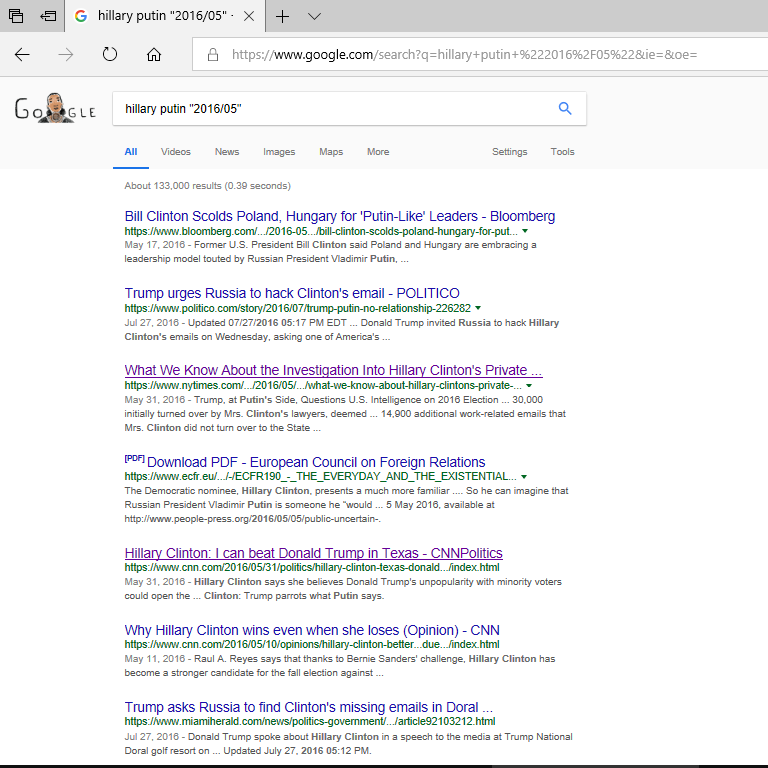 To avoid cherry picking, I sampled the mainstream media articles using Google Search. The anti-Russian hysteria and accusations of Trump-Putin collusion started on July 18 after the DNC and Hillary campaign had learned that WikiLeaks was going to publish a large cache of leaked DNC documents, and planted media stories with bizarre allegations ranging from Trump is strangely accommodating to Russia to Trump is Putin’s puppet. In a few days, hysteria grew into a frenzy. 06-05: Moderate conservative Forbes writes about alleged “Putin’s Army of Internet Trolls” influencing Hillary’s email scandal. Notice that it talks about the old Hillary emails, the emails that had leaked from her illegal server during and prior to 2013. 06-15: Another Forbes article by the same author develops the same idea based on the DNC announcement in WaPo. 06-16: Observer publishes an article Vladimir Putin Has Everything He Needs to Blackmail Hillary Clinton. American intelligence officers are asking not ‘if’ but ‘when’ the Kremlin will dip into its arsenal of Clinton collateral. If Putin can blackmail Hillary, then Putin is more likely to prefer Hillary as president. 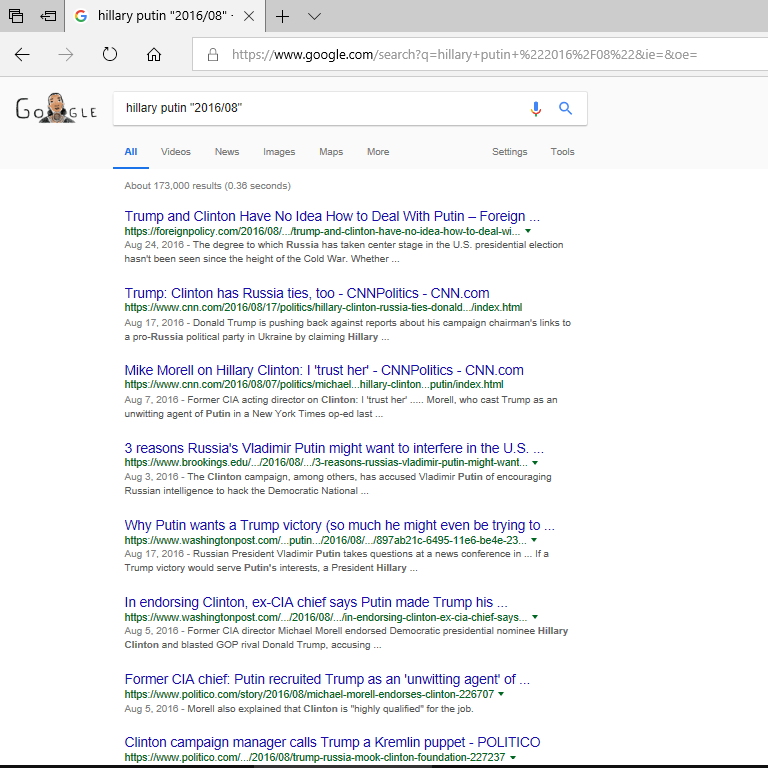 06-17: CNN likes Putin and shows how Putin likes Hillary (archived). After July 18, 2016: all hell breaks loose. 07-21: The Atlantic publishes a hatchet editorial by its editor-in-chief Jeffrey Goldberg: It’s Official: Hillary Clinton Is Running Against Vladimir Putin. Fulfilling what might be the Russian autocrat’s dearest wish, Trump has openly questioned whether the U.S. should keep its commitments to NATO. The claim in the subtitle, alleged on an “edited transcript” of the same day NYT interview with Trump, is FALSE. But also note the sharp change of the tone of the liberal media towards Putin, and its clumsy hawkishness. Reading the interview in hindsight, one notices that the NYT interviewers attempted to entrap Trump into “questioning U.S. commitments to NATO” at least four times. Sanger and Haberman are NYT jornos. TRUMP: I don’t want to tell you what I’d do because I don’t want Putin to know what I’d do. [sic!] I have a serious chance of becoming president and I’m not like Obama, that every time they send some troops into Iraq or anyplace else, he has a news conference to announce it. That leaves the impression that the most respectable (in 2016) MSM publications, the NYT and the Atlantic, coordinated with the DNC and/or Hillary campaign. Another impression is that the Atlantic’s editorial might have been written before the NYT interview happened, based on a promise of the answers the NYT interviewers would elicit from Trump. Nancy Pelosi, a world-renowned expert in cyber security, energy, atmospheric physics, meteorology, biochemistry, and all other sciences and technologies, knew that for a fact long before the NSA, DHS, DNI, or CIA had an opportunity to even ask for evidence. Hillary Clinton, an expert of the same standing, shared her confidence. When Nancy Pelosi and Hillary Clinton knew something for a fact, who could dare question that “fact?” Certainly not government agencies. All past attributions of network security breaches to foreign governments based directly or indirectly on methods or announcements of CrowdStrike, FireEye, SecureWorks, and Fidelis should be voided and re-analyzed. From now on their past “findings” and their methods should not be used for attribution. Where is the “Trump Tower meeting” on (June 8) between Trump’s son and Veselnitskaya and Trump’s joke that Putin might find old Hillary’s emails (July 31)? They are not relevant for the discussed events. Neither meeting foreign citizens nor joking about Hillary’s mishandling of classified information is a misconduct or evidence of a possible crime. These and other non-events have been “pulled by ears” by the DNC and compliant media to support their narratives. Both narratives of Russian elections hacking and Trump-Putin collusion narratives are fabrications that originate in the DNC and Hillary campaign. The planted WaPo article Trump campaign guts GOP’s anti-Russia stance on Ukraine also mentions Paul Manafort, a former adviser to Ukrainian president Yanukovich, as “evidence” that Trump had colluded with Putin against Ukraine. This is what passes for logic in the MSM. Apparently, Mueller has been persecuting Paul Manafort based on WaPo fake news. For Paul, it’s a combination of good news and bad news. The good news is that if he walks out of the current trial free he can sue WaPo and its owner, Jeff Bezos of Amazon.com. The bad news is that Robert Mueller and his buddies are extremely motivated to not let this happen. According to Reuters, Robert Mueller even investigated the 2016 Republican National Convention! In January 2017, one of CrowdStrike’s attribution to its leading scarecrows Fancy Bear was accidentally checked — and proven false. CrowdStrike was exposed as a fraud and inept outfit, but the exposure had no durable adverse effect on CrowdStrike. On May 17, 2017, the DOJ announced the appointment of Robert Mueller as the special prosecutor, and CrowdStrike announced a $100M round of financing at the valuation of $1B! The same day match might have been a coincidence, but the return of Robert Mueller to a position of power in the DC has been anticipated for some time. A top Crowdstrike officer and shareholder Shawn Henry joined CrowdStrike from the position of Executive Assistant to FBI Director. Robert Mueller and was in touch with him after resignation. The business idea for CrowdStrike was almost certainly discussed in the office of FBI Director Robert Mueller in early 2012. The incorrect claim that Russian interference in the 2016 election was in favor of Trump has been entirely derived from the opinion and “data” provided by CrowdStrike. Robert Mueller probably took CrowdStrike’s words as a holy writ. DNC Wikileaks Hack Outs Hillary Shill at Washington Post (American Thinker, 2016-07-25). 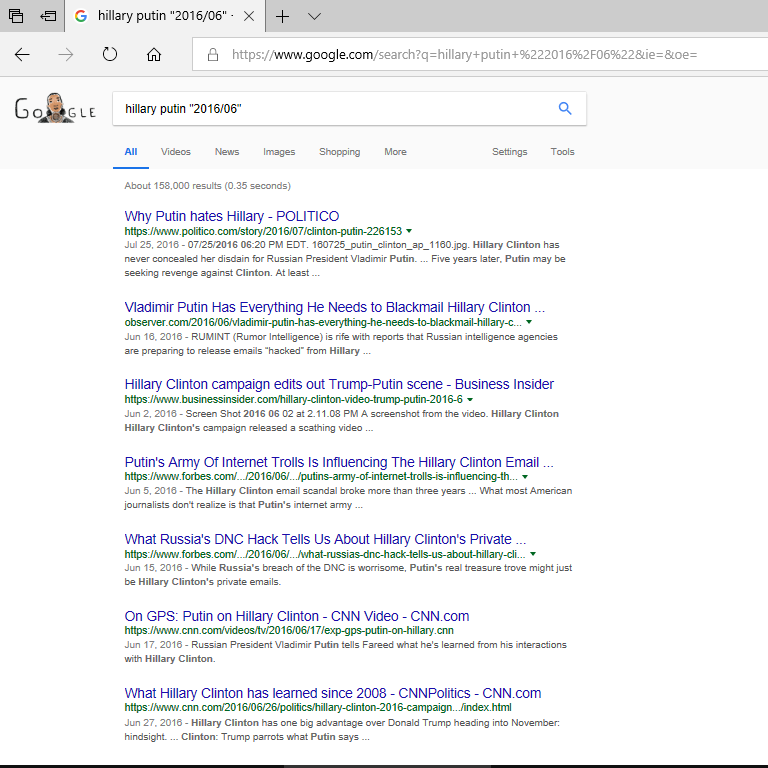 The shill is Greg Sargent, not any of the authors who posted the DNC claim that it had been hacked by Russia or that Trump weakened the GOP platform on Russian-Ukrainian conflict. I wonder how many WaPo editors and authors are not DNC shills? Yes, she said this. Americans and good thinking Republicans. What is the ‘Advanced Persistent Threat’? 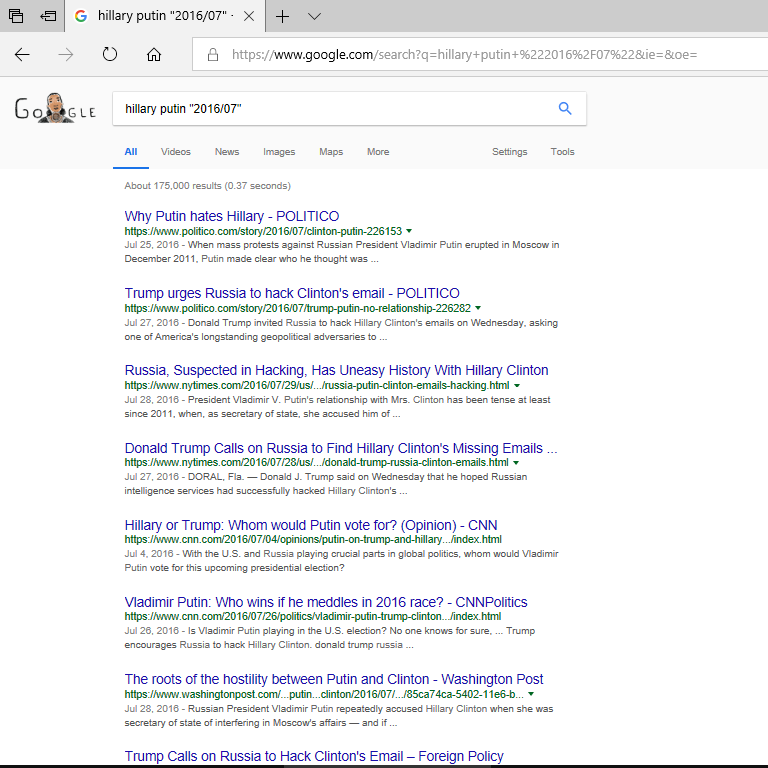 Origin of Operation "Crossfire Hurricane"
Skolkovo: Mueller, Hillary, and the Masters of the Universe – OMG!